Let’s face it, treadmill workouts can be a bit boring – especially this time of year when winter weather in many parts of the country can make outdoor walks/runs a dangerous adventure. So how do we beat this boredom? Thankfully, there are quite a few options out there that will keep you entertained and make those indoor treadmill sessions much more enjoyable and, ultimately, much more effective. After all, this is exercise….so always keep in mind that health and fitness is the ultimate goal. Now you have to be a bit careful on this one because reading and staying upright on a treadmill can be quite tricky for some. I only recommend this one for those treadmill sessions done at a slower pace (walkers, incline workouts, etc.). For those who are looking for a more challenging workout, I’m going to be honest….if you’re reading during your workout you’re probably not working hard enough! A better idea/option for those who like to read while working out is to take advantage of an audiobook and let someone do the reading for you while you listen and attack your workout at the same time. There are some great options out there for audio books, such as Audible, playster.com, Amazon and many, many more. Podcasts are also a great option. When I hop on the treadmill or stationary bike I like to listen in to my favorite fitness or motivational podcasts and learn from some of the great minds in the business. There’s no doubt that music is a great motivator when it comes to working out! Take some time and create a few different playlist of your favorite artists, music, etc. Keep in mind that you’ll want to focus on music that motivates you or makes you want to move. There’s nothing worse than getting 20 minutes into a run and having a sappy bring-you-down song come on! You’ve heard me mention them before, but intervals are one of the absolute best ways to not only challenge your body, but also make your workouts more exciting and entertaining. Try adding intervals in once per week to start. Those who normally walk should add some jogging intervals, if you normally jog, add some sprints. 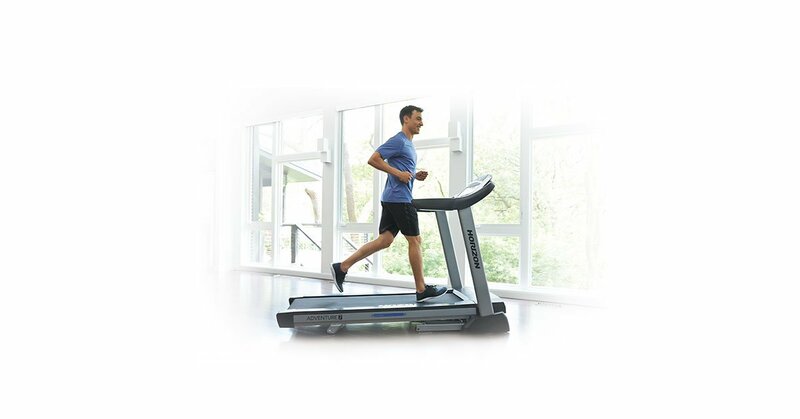 Most treadmills have pre-programmed workouts and should include at least a couple of interval options. Otherwise, you can easily create your own. After a 5 minute warm-up, speed up for 30 to 60 seconds. After a 30 to 60 second recovery, repeat the interval again for a set number of rounds. There’s always the old stand-by of watching TV and catching up on your favorite shows during your workout. Many treadmills (especially in a commercial gym setting) feature attached TV’s. Just be sure to find something that keeps your interest and allows you to work at a good pace. And if working out in a gym around others, don’t be “that guy” who laughs out loud or cheers for their favorite team forgetting that everyone can hear you! For at-home treadmill users, be sure the TV is in front of your treadmill and in a good position for you to see while you exercise. You should never have to turn your head to watch TV while on a treadmill. This was the trick I used to use way back in the day to help get me through a tough treadmill workout. By covering the console with a towel, it gave me more of an outdoor run feel because I never knew how long I was running, the distance, my heart rate, how many calories I had burned, etc. I just got on, set my speed, and went until I was ready to be done! While the bells and whistles of a treadmill are nice and can be useful, sometimes it’s great to be able to avoid them and keep the clutter out of your mind. This one is more for those who workout in a commercial gym setting with treadmills side by side. Find a friend and make your treadmill workout a little competitive. First one to a mile, longest distance in 30 minutes, etc. Just be sure you’re paying attention to what you’re doing and not continually glancing over at your competition! keyboard_arrow_left Are You Sore from Your Cycling Workouts?